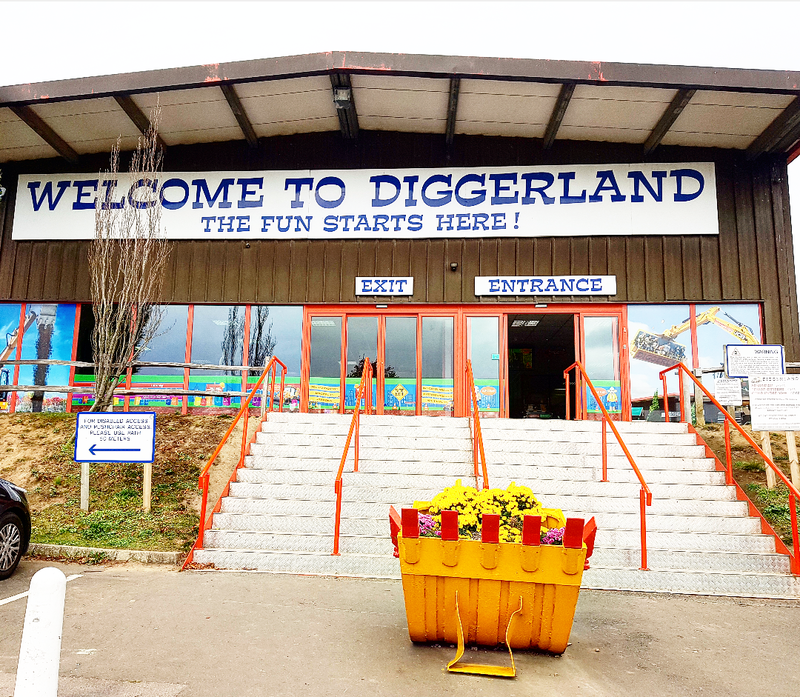 Cupcake Mumma: Half Term Fun at Diggerland! 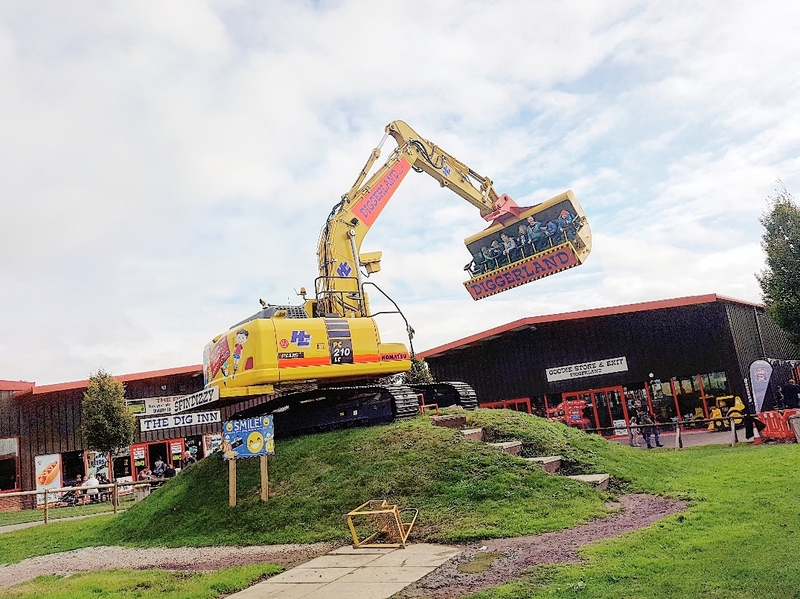 Half Term Fun at Diggerland! 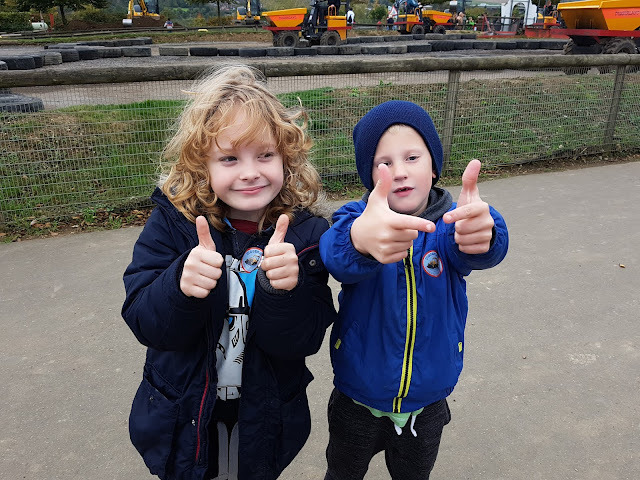 Once again we have packed up the car and have headed to Martyn and the boy's house to enjoy a half term as a family of six! 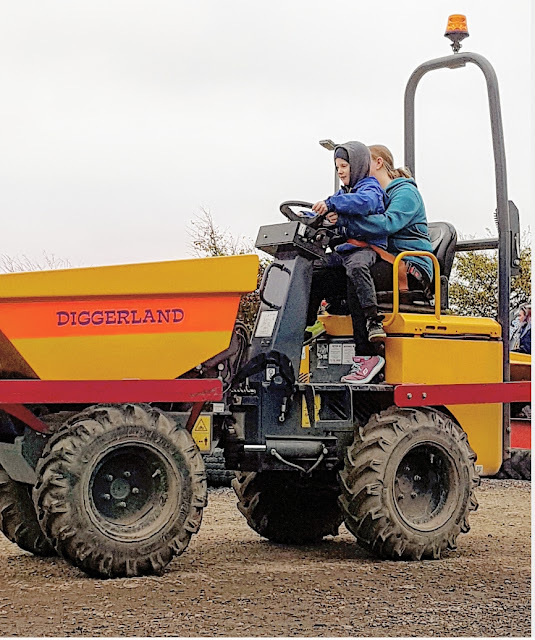 We had a few plans for half term but the one the children and Mr K and I were really looking forward to was our family trip to Diggerland. Diggerland (which is based in Kent, Devon and Yorkshire ) is a fun, family attraction full of diggers and large machinery for both children and adults to enjoy. You can dig up the ground, test your skills with hook a duck, enjoy a 'train' ride, brave Spindizzy, eat, play and have even more fun than that! There is so much to do. 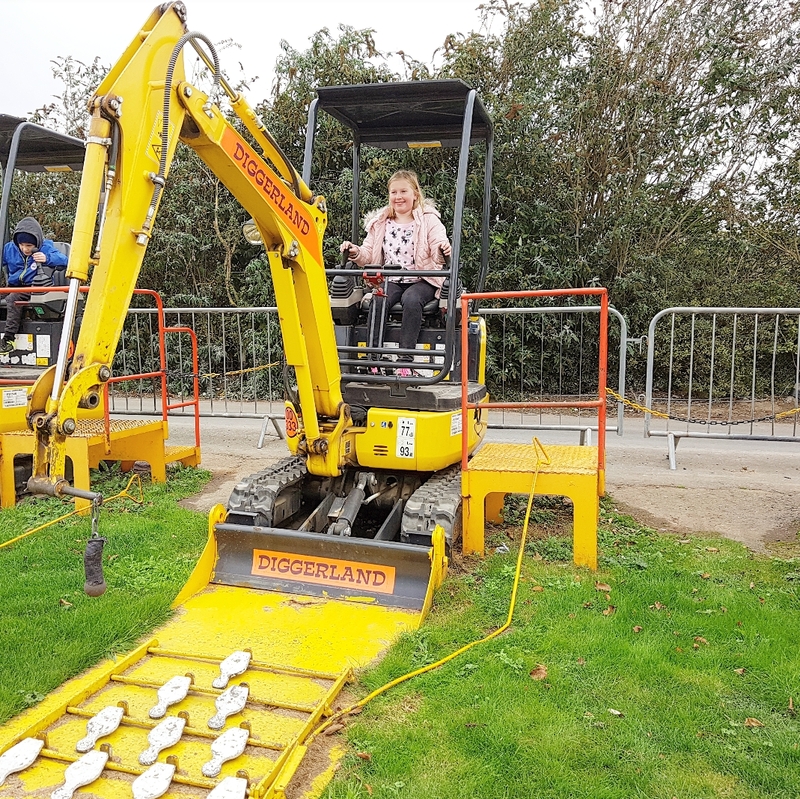 Older children can use most of the machinery by themselves but smaller children will need help on most of the activities. I found this out when 3 out of 4 children came up as under 1.4 meters and I had to do 3 laps of the dumper truck course plus get beaten up 3 times on the bumper cars! 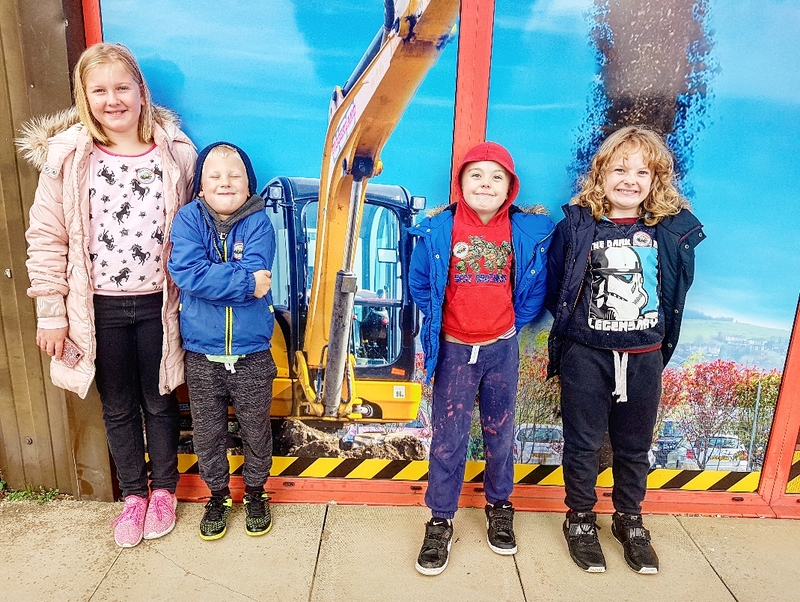 Very excited children ready for our first family day out! 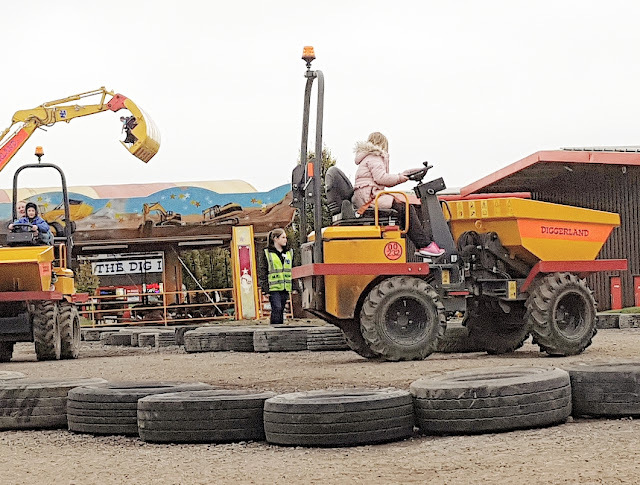 We arrived at Diggerland in the late morning making sure we dressed appropriately for a busy and possibly dirty day (we didn't get dirty at all!) 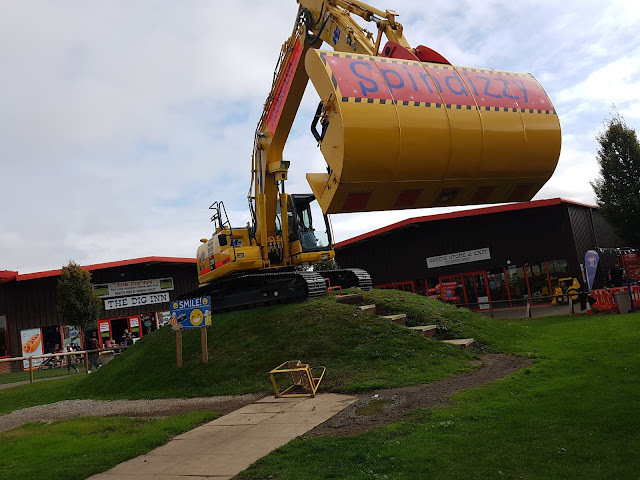 I've never been to Diggerland before so I wasn't sure what to expect. 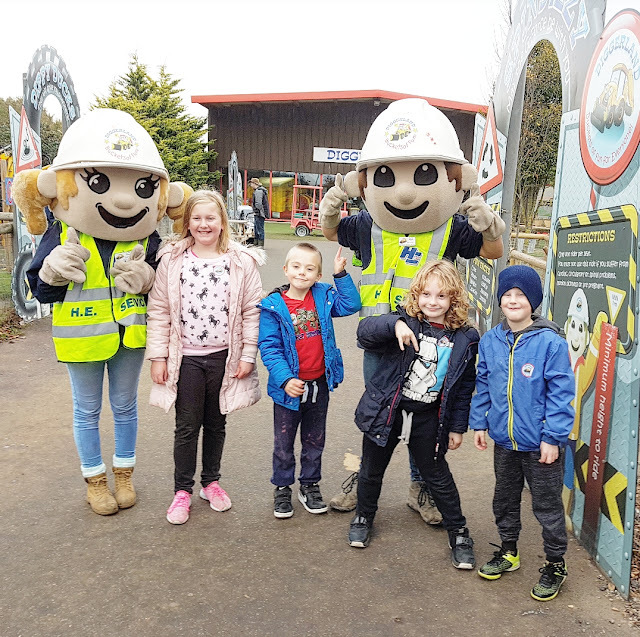 All the children were instantly ready and raring to go, full of excitement and happiness. All aboard the digger express! There was one ride the boys and I couldn't wait to check out. 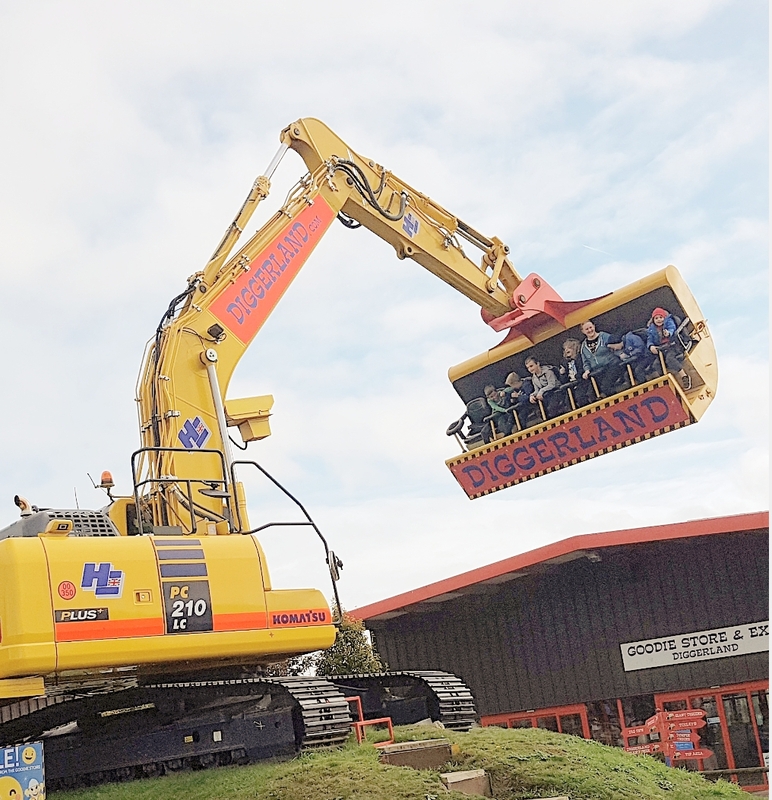 I'm a bit of a wimp when it comes to rides but Will and James were goading me a little and I couldn't let them get away with it! Little A bravely joined me and before I knew it I was on Spindizzy high in the sky! As you can see from the pictures below, the ride goes up higher, 3 times to be exact and stops to reverse the spin. It's pretty gentle but if you don't like heights you might still want to give this one a miss! The boys jumped on first and loved their time on the diggers. Midge jumped on one at the end and I watched her get into it (as predicted!) She was very pleased when she managed to pick out all 3 ducks before her time was up. Next on our list was 'Digging for Treasure.' The children had to operate the diggers by themselves (adults can accompany younger ones but our kids were more than happy to go alone!) 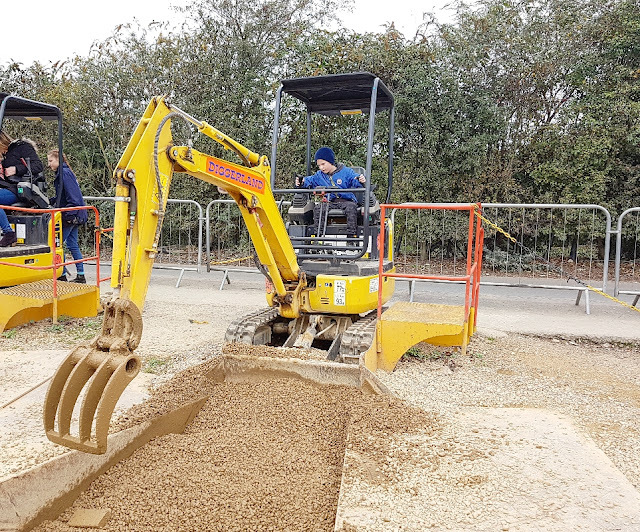 Large bricks are hidden in the gravel which you have to dig up using your best treasure seeking skills! Will and Little A loved this activity and did really well. James found it tough because every brick he collected kept falling through the gaps of the claw. Midge got several bricks out and seemed to enjoy herself too. Midge having fun at the temping bowling. 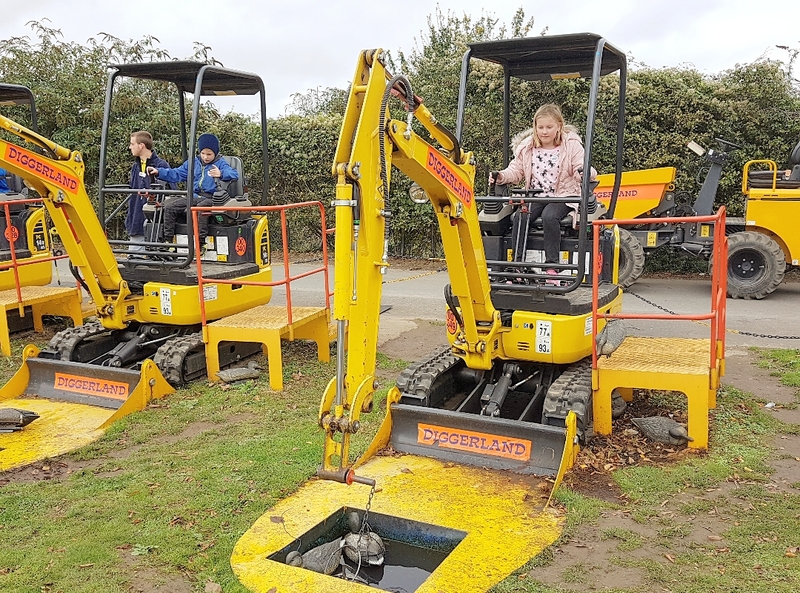 Another activity all the children were looking forward to was the driving of the dumper trucks. 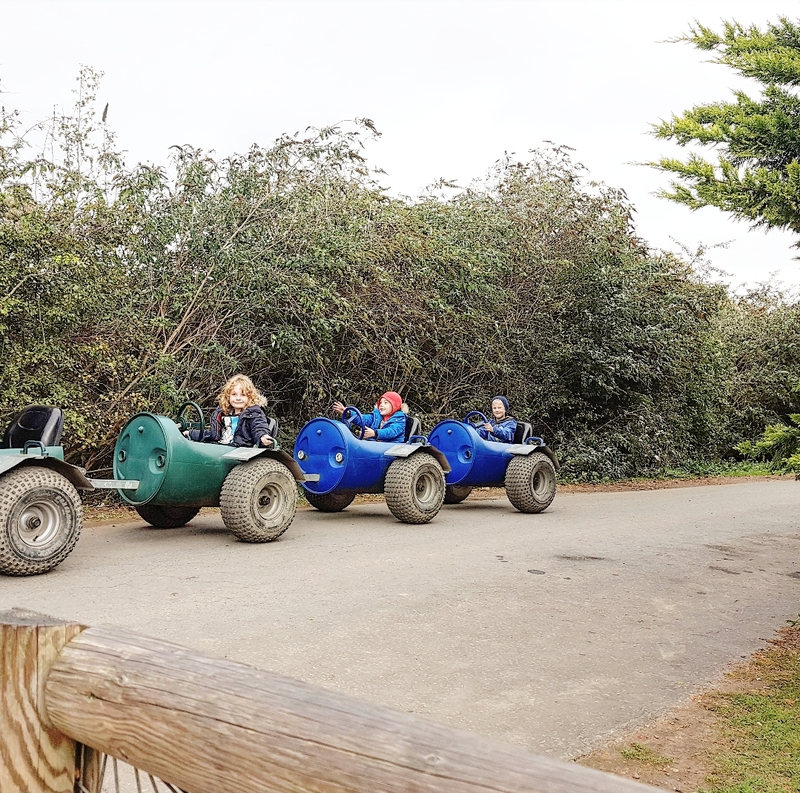 Midge was the only one tall enough to ride on her own which was awesome to watch, I was so surprised she went ahead and did it alone but I was so, so proud of her as was Martyn who watched from the side to capture all our fantastic (but also frightening!) moments. I had to go around the track 3 times with each of the boys. They all had good fun despite all being vocal on wanting to go on their own. Once they realised it was with me or not at all they soon stopped moaning and enjoyed the ride. The trucks are very slow and you have total control, just accelerate and stop (oh and don't forgot to steer!) I can't say it was my favourite activity but I think it was for the children. Midge doing very well on the dumper truck closely followed by Little A and I! We headed to cafe on site for a spot of lunch and a loo stop. I was really upset to see the disabled toilets were out of order and no one knew anything about them and there were no other disabled toilets on the site. 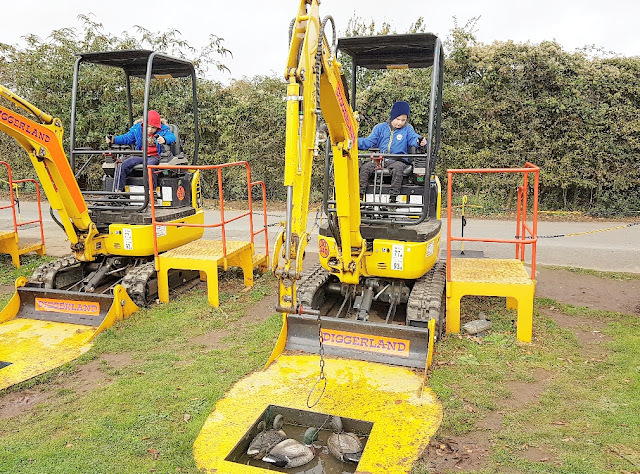 The manager was really nice and assured us the problem would be solved straight away or as soon as possible. We did manage to sort something out and enjoy the rest of our day. 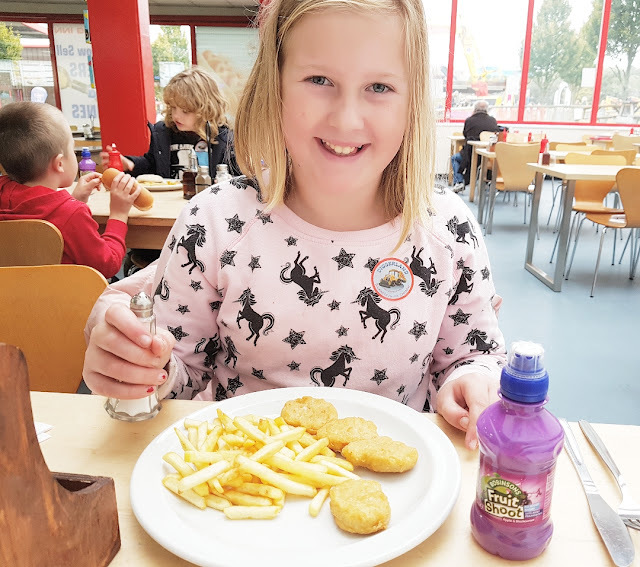 We got on with our lunch which I thought was standard attraction priced food. All the food tasted great too. 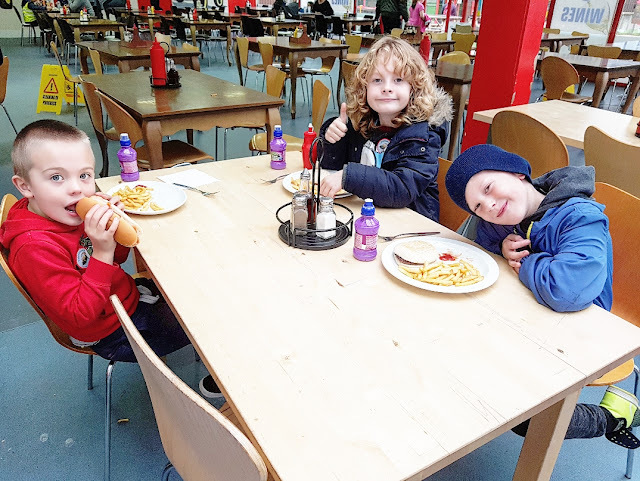 The boys opted for burgers and hot dogs, Midge went for some chicken nuggets and chips and Mr K and I went for a rather yummy all day breakfast option. It really filled a hole! After letting our food go down we popped to what I would call the merry go round of diggers! 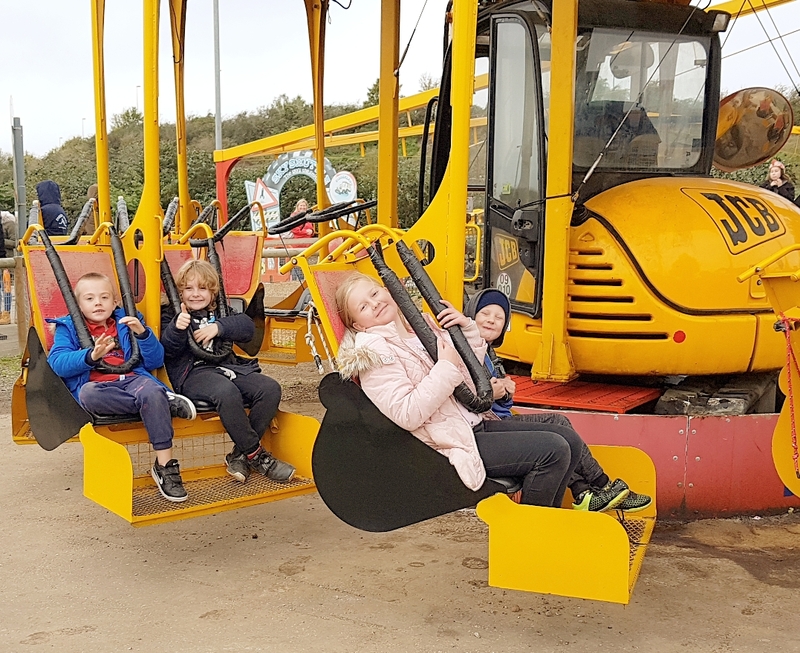 This ride started off as a normal merry go round would then lifted outwards to make the seats a little more higher. The children loved it! Our final ride was the bumper cars. I don't have too much to say other than I really dislike bumper cars but I had to go on them because yet again only Midge was tall enough to ride alone (seriously kids, grow please!) They all had fun and I can't deny I had a few laughs. I also had a giant bruise down my thigh the next day but hey, everyone else had fun right!? 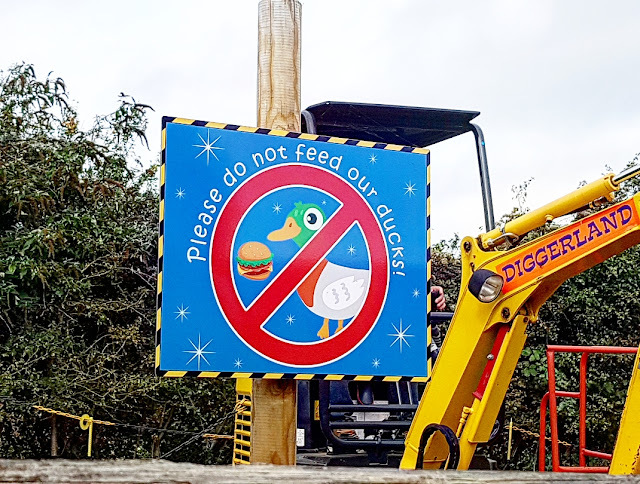 Midge: I LOVED the bumper cars, they were so much fun and hook a duck was great because I got all three ducks out of the water! Will: The bumper cars were my favourite and Spindizzy was awesome! James: It was awesome! I didn't like digging for treasure, the bricks kept falling but the rest was really cool. Diggerland is a really fun day out for children. The tag line is 'Buckets of fun for everyone' which I do think it delivers. You can go on rides with your children and that is fun but you also get a lot of enjoyment from just watching them do the activities and cheering them on. If you are disabled, although the park is totally accessible, if you have mobility issues like Mr K does you will not be able to take children under 1.4 meters unaccompanied, they would miss out on a lot otherwise you should jump in the car or hop on the train and find your nearest Diggerland! 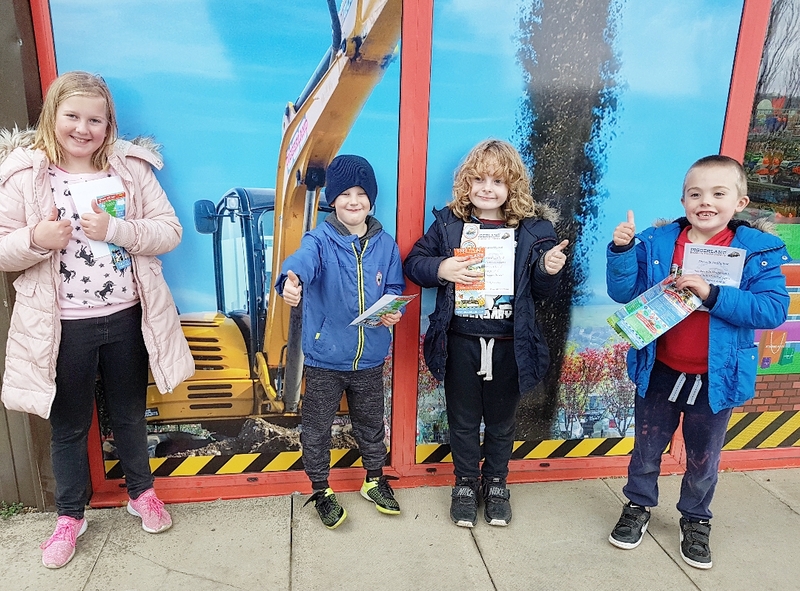 Thanks to Diggerland for providing all 6 of us with tickets to experience such a great day out this half term.